Potash Nursery Ltd are completely dedicated to your total satisfaction. If you have any suggestions or comments please email us using the link on the store page. Cow Green, Bacton, Stowmarket, Suffolk, IP14 4HJ, United Kingdom. We only accept orders for dispatch to a UK address. We accept Visa, Visa Debit and Mastercard. Payment will be taken from your card when the order is placed even if a deferred delivery date has been agreed. You may send your credit card information via phone, post or over the Internet. When confirmation of order is received, this is to indicate that we have received your order. It does not indicate that a contract exists between us. We will indicate acceptance of your order, and hence a contract between us, when payment is taken from your card. We have included this term to protect us in the case that a mistake has been made in pricing, we have inadvertently under-priced goods, or we are no longer able to supply a particular product for some reason. In the case of a change of price, we will always contact you first to ensure that the price is acceptable. a - No plants will be despatched during frosty conditions. If this happens we shall not inform each customer separately. Dispatch begins from early March each Spring (weather permitting). Orders can be placed at any time in advance with a specified week for delivery (which will be adhered to as closely as possible, but is not to be regarded as a critical element of the contract), please allow a minimum of 30 days for our team to process your order. If no week is specified then the plants will be sent during April (the middle of our dispatch season). Orders will only be accepted up to 31 May as after this time we do not have plants on the nursery small enough for mail order. Credit Card Security If you choose to pay using secure credit card payment you will be taken automatically to a Realex webpage. Realex are an accredited payment service provider for online payments, for further information please visit their homepage at www.realexpayments.com Potash Nursery does not receive any details of the card which you use to make the payment. Alternatively you may send in a cheque, or contact the nursery by phone to arrange card payment. 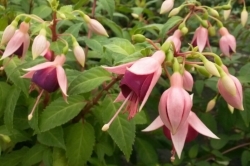 We only send out well established young plants of excellent quality, exactly the same stock as we use ourselves for growing on at the nursery. We are therefore happy to guarantee our plants for 14 days from the date of dispatch. If you are not completely happy with the plants please return them to us in their original packaging and we will provide either replacement or refund at our discretion. Please note if the plants are not returned to the nursery within the 14 day guarantee period no further correspondence will be entered into. After this time failure of the plants will be due to the growing conditions, which are beyond our control and for which we cannot be held responsible. You are entitled to cancel your order from the day of ordering until the date of dispatch, however, because of the nature of the goods, once we have disptached your plants, under section 13, paragraph 1c of the Consumer Protection (Distance Selling) regulation 2000, goods that are liable to deteriorate or expire rapidly means your statutory 7 working days cooling off period is void. Before dispatch all plants are carefully examined and packed to ensure that they arrive in perfect condition. All parcels are covered by insurance against damage, loss or delay. If your plants are not in good condition upon receipt because of damage or delay please notify us immediately by letter (first class), giving date of arrival of parcel, so that we can make a claim against Royal Mail. Please retain the box and contents so, if necessary, they are available for inspection. Complaints cannot be entertained unless these conditions are adhered to. If they have been damaged in transit plants will be replaced free of charge as soon as availability allows. Potash Nursery Ltd do not disclose buyers' information to third parties other than when order details are processed as part of the order fulfilment. In this case, the third party will not disclose any of the details to any other third party.